My life has been so edified by you, the kind readers of this blog. With your sweet comments and e-mails you have given me confidence as a writer, with your excellent book recommendations you've given me many delightful evenings of reading, and with your loyalty you've given me the motivation to continue this discipline of blogging. I want to thank you and express my sincere gratitude in some tangible way. I wish I could give one of these to everyone who visits! Sadly I can only gift this giveaway to one person, but my gratitude and prayers (yes, I pray for you each day... mostly not be scandalized by anything I write!) extends to everyone. I also know that many of you aren't familiar with all of the bloggy accouterments and doodads. Let me give you a rundown of some of the symbols (which will play a part in how you enter this giveaway). On the right sidebar you should see something that looks like this. The orange box with the signal symbol on it is called an RSS feed. If you click this (and then click "subscribe" after that), you can read all of the posts from this blog on your computer desktop, in a feed reader (such as Google Reader or Bloglines), or even as a folder in your bookmarks that will auto-update each time there is a new post here. The envelope icon is an e-mail subscriber. Instead of visiting the blog to see if there has been an update ('cause I post at all hours of the day), you get an e-mail each time there is a new post. The blue Facebook button is for my page on Facebook. If you have a Facebook account, you can "Like" my page on Facebook and receive blog updates there (and also extra pictures, statuses and things that don't make it to the blog). The little blue birdie icon is for Twitter. If you tweet, you can get updates there. The YouTube button is for my channel on YouTube. Hopefully this will get more use in the coming months. Finally there is that "Follow with Google Friend Connect" button. If you have a Google account (or even Yahoo) this is another way to stay updated. Giveaway Rules: There are 3 possible entries for this giveaway. 1. 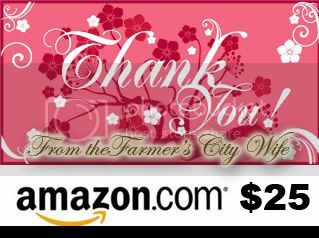 To enter, simply leave a comment answering the question: What is your favorite type of post on City Wife, Country Life? Recipes, stories, marriage posts, photos, earthy crunchy stuff, homeschooling, homesteady stuff... something else? (I'm not doing this to inflate my ego. Seriously! I just want to know which types of posts I should focus more of my attention on in the future). 2. To increase your chance with a second possible entry, leave a comment indicating that you have (or already) subscribed to this blog by RSS feed, Google Friend Connect, or E-mail. 3. For a third possible entry, leave a comment indicating that you have (or already) liked CWCL on Facebook, followed on Twitter, or subscribed on YouTube. Entries must be received by Tuesday, February 22nd at 11:59pm PST. The winner will be announced on Wednesday. Good luck, and seriously... thank you! Oh, and if you need any ideas on how to spend it, I'd highly recommend: this , this , or this . Oh get outta town! The LOVE story posts of course!! But I look forward to your blog because it is so versatile and I really never know what you're going to come up with next :) Variety is the spice of life!! I follow you on twitter & like you on Facebook! I might be your #1 fan!! My favorite CWCL posts are usually marriage-related, stories, or Catholic-themed, though I sometimes enjoy housewifey stuff. And I like your personal posts where you take part in memes, too. Also, I subscribe to you in Google Reader, which is RSS fed. I'll double-check to make sure I'm following you. I most enjoy your posts about marriage. Thanks for all the great writing/inspiration! I love the Love Story! I just wish you would keep them coming a little quicker but patience is a virtue! I also love any thing with cooking!!! Aaaand, I use Google Reader to subscribe. =) Thanks for all you do! "Our Love Story" is the best! I've also subscribed to your blog via e-mail. 1. I enjoy reading about the chicken adventures. 2. Google Reader all the way. 3. Done (Facebook). Done (Twitter). Done (YouTube). I adore your love story posts. I can't wait for the next installment. Then again, I love the recipe posts. They're all fun! Well, this is not exactly an answer to the question but I, too, enjoy the versatility. I like each of the post genres and the very fact that there is something different every day. Don't disqualify me for being honest! I also like the frankness of the blog. Everything is not always Sugarplum Fairy Land, and your writing reflects that, though you also include liberal doses of the former. And for my second entry, I liked CWCL on fB a long time back (and still do). I get your posts by email every day - the first blog I have done that with, and it has really worked out wonderfully. My favorite posts so far as the Love Story ones! I'm anxious to hear the rest! My favorites are the love story posts, and your humorous vignettes about farm life. WOW! I love the way you write, so how do I narrow down the types of posts I like best? I guess if I have to choose just one, I'd go w/ your marriage posts. The love you have for your DH is so inspiring! I just "Liked" you on Facebook! I like the homesteady stuff, because it really inspires me and shows me how someone else is letting go of the busyness and consumerism of everyday American life for something more down-to-earth. I've done it! I've "subscribed to this blog by RSS feed," which is something I'd never done before because I didn't know how it worked. Well, I STILL don't know how it works - not exactly, anyway - but hey! I'll give a whirl to anything that might get me both an Amazon gift card AND the chance to keep up with my fave blogger! I like the recipes and homesteading stuff the best! hanging on to every word of "Our Love Story"